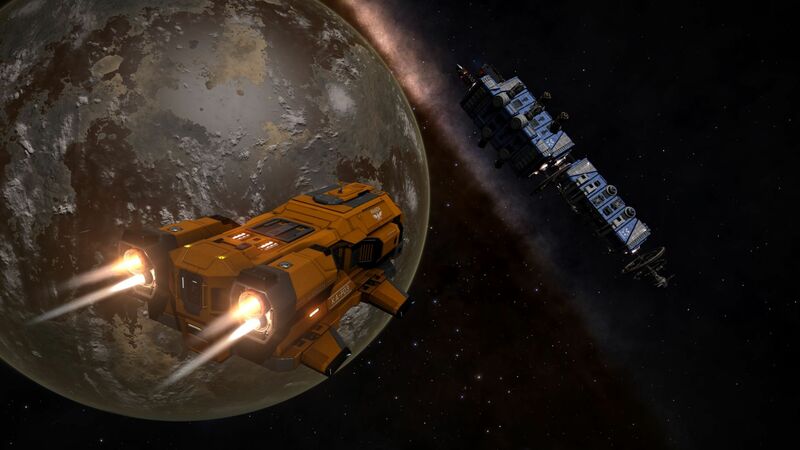 Few hours later arrived into system Jambin an yellow Type-7 Transporter using Panda name which had most of internal slots filled with economy cabins. Karina set ship's course towards the Chiang Prospect and then after short fly left from the supercruise (SC). 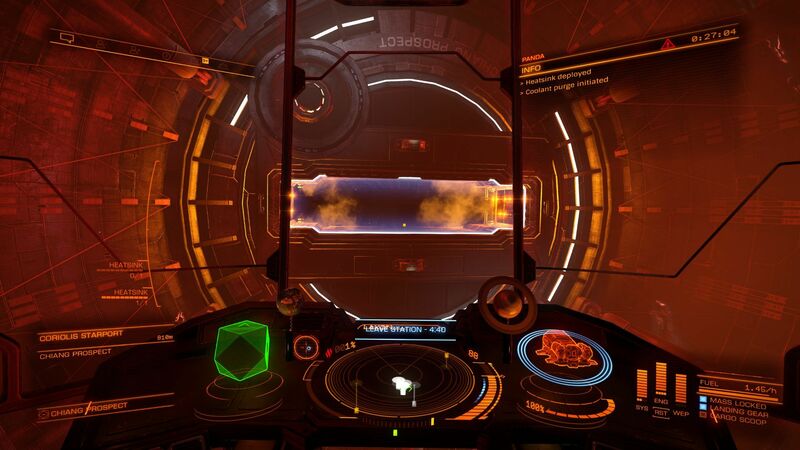 When the station came for a first time into visual range she was shocked, she never saw something like this. 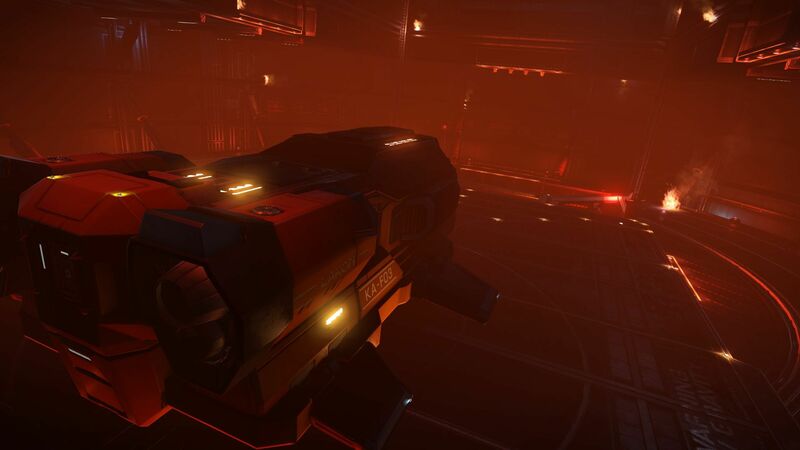 She asked for docking clearance and then quickly headed inside where tried to avoiding numerous explosive debris floating inside of the station. There was hot, really hot, inside there it looked like in hell, one heatsink was only barely enough to cooling Panda on her way to the designated landing pad. Economy passenger cabins on the Panda were filled to the last place and then was ship carefully piloted towards the station exit. 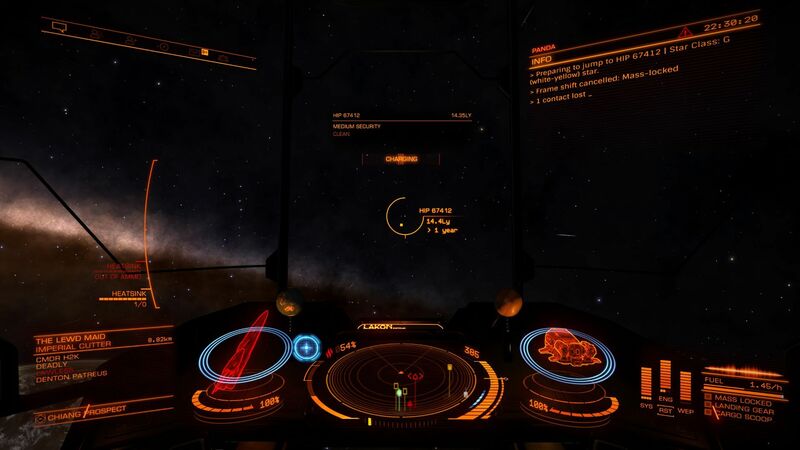 Karina thought that the worst was already passed, but right after leaving the station mailslot her ship shaked, shield has weakened, and ship's HUD displayed warning symbols about interference affecting sensors. Next to this appeared directly ahead of Panda small SLF (ship launched fighter) which was firing lasers on her ... "What the hell is going on?!?" was Karina's first reaction. Why should anyone attack such defenseless ship like T7 which is trying to rescue stranding people? Here's no profit, no any job which could bring hidden opponent, no political reason, ... only ... only ... Karina suddenly recalled an specific part in the long letter from her father which she read on board of her first ship Bubo. He warned her that space have many dangers and one of them are outlaws which search for destruction, dominance, and do not hesitate attacking weak targets. Karina have ironically smiled about her obvious naivety, she was so sure that met such persons is statistically impossible given galaxy size, but now it was clearly obvious to her that she was wrong. And why the station do not destroy such attacker in the no fire zone? ... All this passed through Karina's mind in just fragment of second when she in the same time launched another heatsink, put four pips into shields and FAO boosted forward while doing corkscrew maneuver. Now all the time spent with the ship preparations, engineering (eventhough just basic) and additional defenses were paid off. Karina set course to random system and initiated high-waking sequence. 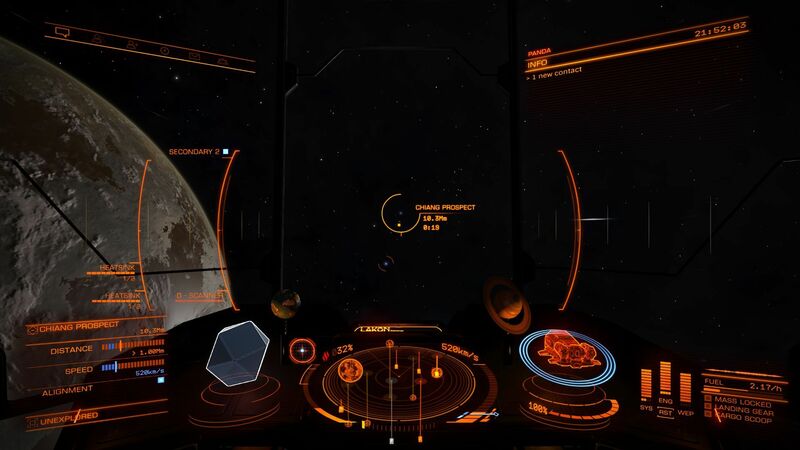 Ship shields were failing, but in the next moment a FSD drive has activated and T7 succesfully escaped. 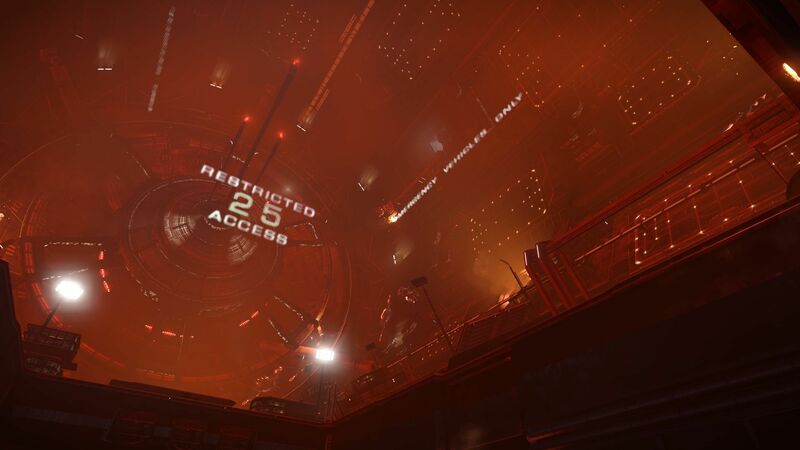 After successful escape Karina immediately dropped from SC and plotted course to another system, FSD was activated and she was now safe from any persecution. Ship shield was restored to full strength and it was time to return and deliver all evacuees on the evacuation ship. Arrival at the evacuation ship, and transfer of her passengers has went smoothly. 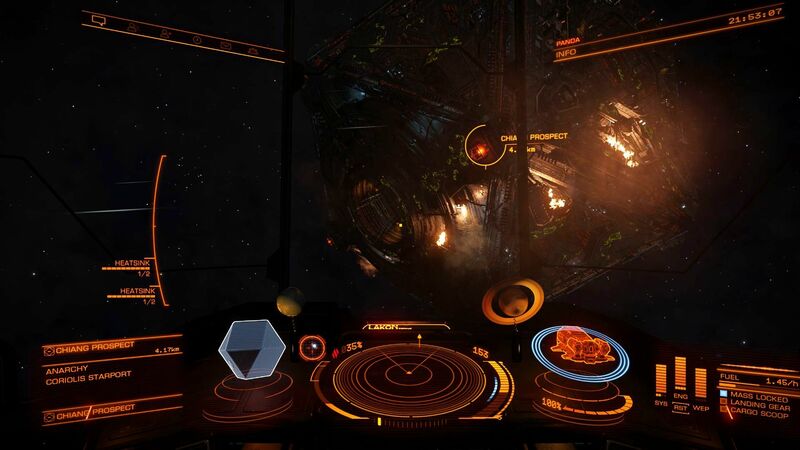 Karina decided to go for a second round and headed again to the damaged station. In the meantime she searched through sensors data and found there identification of ship which performed previous attack. It was Cutter named The Lewd Maid which should be owned by commader H2K with possible ties to terrorist group named League of Reparation. These terrorist often used anarchy systems for operate in safety against ATR ... and .. oooh ... Jambin is an anarchy system! It was clear response to her earlier question why the station defenses did nothing. "Oh well, now is the time to call for help! ", she thought and sent a message using backup frequency, given her by father. "Please use it only when will be really necessary", he wrote in that time. Reply to her message came in few minutes, it was "unusually" long message "ETA 20 min". Karina reached to the damaged station and quickly headed inside, while have evading another attack ... but attacker was obviously cautious with shooting at close distance on the station, and she therefore passed into station without much damages. "Refugees boarding will take some time" she though, "so, I can wait for a message whether is area safe". Waiting was in the end little longer and passengers on board started asking what is going on. Karina explained the situation and asked for little more patience: "it's better to wait a few more minutes than to hurry and be destroyed by an "fellow" human commander". Finally ship's com announced incoming call: Hello Karina, all should be good now. There were in the end two outlaws, that second named Kazumih (we do not know who it is, yet) joined fight when I was here alone. But my backup arrived (two friends from Ghost Legion in FDLs) just in time, and these two swiftly fleed once saw that they may be in danger. We will stay here for some time to assure that area will stay safe. 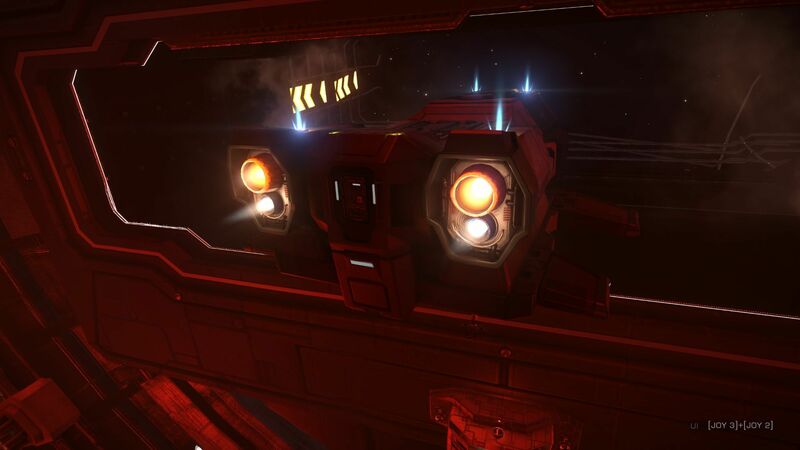 I heard that you have few new ships in time when you are space pilot ... very good! I really look forward to a time when we can meet and have had a long talk. There's so much what I want to say you, please keep safe until that time ... and if needed, just send me a message like today. Cya! ... "He really do not give me much time to say something! ", have laughed Karina, while asking station for permission to leave, and then continued in rescue operation. Interesting. Not thatI could help. Well …….. not yet anyway …… nod, nod, wink ,wink.